An important part of a good home security system is motion sensors. Security systems are usually made of different sensors around the home that detect movement, sound, and other signs of a possible break-in and activate the alarm. Motion sensors are a crucial part of this system and it is important to understand what they do, how they work, and the different types out there before choosing a home security system. What are motion sensors for? Motion sensors are the main sensors your system will use to detect a break-in by providing information that someone is moving around your home and the alarm hasn’t been deactivated. There are different types of technologies when it comes to motion sensors, but the idea remains the same – detecting movement within the secured area, either indoors or outdoors, and alerting the security company and police in the event that something is detected. Motion sensors only work when you’re not home, or when you go to bed and turn on the alarm so that it doesn’t go off every time you move around the house. Because motion sensors are only part of your security system and linked to every other sensor in the house, you can have very interesting features, like turning on the cameras and recording when motion is detected. What can a motion sensor do? It can let you know when someone at home comes in after their curfew (if you turn the alarm on when you go to bed), trigger the doorbell when someone approaches without them having to ring, define restricted areas in the home or outdoors so that even family members don’t go there (like a basement, office, or medicine cabinet), and more. Besides security, motion sensors can help you live a more convenient life in a smart-home environment. Since they detect when someone is in a room, you can automatically have lights and heating systems turn on or off, open garage doors automatically when a car approaches, among many other uses. There are different types of motion sensors and we will discuss the 11 most popular motion sensors below. These types of sensors are very common and are used by many security companies like Link Interactive. They detect heat changes and movement around the sensor, which indicate that someone is in the room. If infrared energy changes at a fast pace, it means that someone is present and the sensor is triggered. If you have pets that walk around the areas with these sensors when you’re not home or sleeping, you should consult with the security company or a professional on where to place the sensors for maximum efficiency. You can also opt for a motion sensor that is more pet-friendly. Protect America uses wireless PIR motion sensors that are pet-friendly and do not detect the movement of anything under 40 lbs. As the name suggests, these sensors use microwave pulses to detect movement. The pulses are sent out over a large area around the sensor and the device calculates the changes in reflection in order to detect a moving object or person. 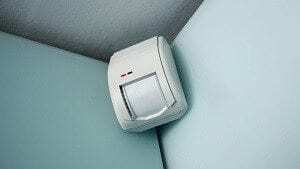 Not many companies use these sensors because they tend to be more expensive and vulnerable to electrical interference so if a burglar knows that these are the sensors in your house and they have a technical background, they may be able to disable them. Some sensors use two different types of technology in order to prevent false alarms. For example, you can have a motion sensor that uses microwave pulses and infrared and only activates the alarm if both methods detect movement. This makes the sensor more effective and reliable. These work similarly to the microwave sensors in that they send out LED rays and use the reflection to determine if something is moving around the room. The sensor measures the distance between the objects the light hits and the sensor itself, so if anything changes it means that someone is there. Another reflection-measuring device, these work like the microwave sensors but use ultrasonic waves instead. When someone moves around a room, they create a vibration that a human doesn’t feel but a sensor can. Vibration sensors are very sensitive to vibrations in the room and activate the alarm at the slightest hint of movement. Most companies today use wireless sensors that combine other technologies such as heat movement to detect an intruder. The most popular security companies provide an all-wireless system which has many benefits both from a security standpoint, and installation convenience. Skycover, LiveWatch, Vivint, and Protect America are only some of the security systems out there with wireless motion detectors. These sensors can be placed anywhere, are easy to install, and don’t require any drilling. They communicate with all of the other devices connected to the security system and can activate lights, cameras, and more when the sensors are activated. The image motion sensor provided by Link Interactive, for example, allows you to get an image feed of what activated the sensor. These are very important and are used in doors and windows. They are triggered when a window or door is opened while the system is armed. Because homeowners still have to use the door to enter their home, there is a short time frame of a few seconds when you can enter the deactivation code before the alarm goes off. If you have pets, it is important to understand what sensors you can install that can protect you and your family without activating false alarms all the time. One method is to use passive infrared sensors that ignore animals up to a certain weight, while another popular method uses dual technology that requires two sensors to be activated in order to trigger the alarm. We recommend speaking with the security company about your needs and what type of pets you have in order to understand what motion sensors you need and where to install them for effective protection. Video sensors automatically start recording video of the area when a motion sensor is triggered. This provides you with a recording of the burglar, but can also be used to save electricity and memory storage by only using the cameras when someone is there. These are solar powered motion detectors that are used outdoors on your patio or in your backyard. They have a strong security light that is turned on when the sensor detects movement and also have a solar panel that allows it to charge throughout the day, making it easy to place and use outdoors. Always read about the different devices available to you in a security system before purchasing, and talk to a professional about your specific needs. Read reviews from other users and security professionals to learn more about the top security systems out there.